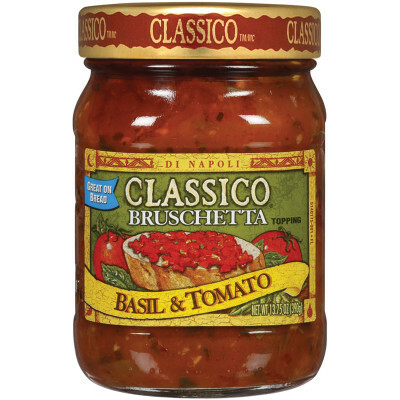 diced tomatoes (tomatoes, tomato juice, citric acid, calcium chloride), canola oil, onions, garlic, distilled white vinegar, salt, basil, dehydrated roasted garlic, spice, natural flavor. 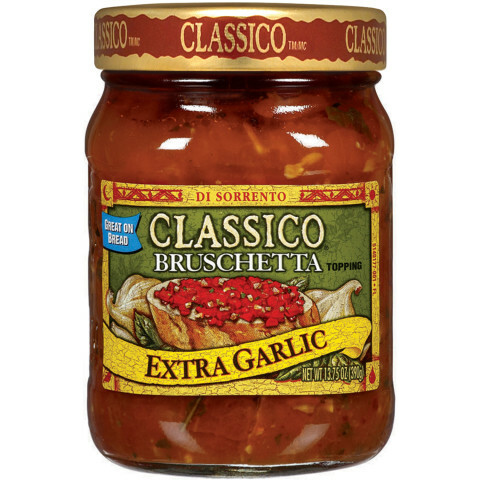 Fragrant with the sun-soaked flavors of Sorrento, Classico® Extra Garlic Bruschetta topping turns sliced, toasted Italian bread into a simple but flavorful appetizer or snack. WHERE CAN I FIND THIS PRODUCT? I love it, but it's getting hard to find. I'm going to stock up when I finally find it. It's the best. This was so surprisingly good and fresh tasting. Flavors burst in your mouth. Need to find more.... went back the shelf was empty... someone found my secret! Oh my gosh this stuff is SO GOOD! I will keep jars and jars on hand........you have to give it a try..........very diet friendly!